Luxul, has introduced its family of managed Gigabit switches with two new solutions that bring enterprise-level performance and features to the CI industry: the 18-port/16 PoE+ L2/L3 AMS- 1816P and 12-port/8 PoE+ XMS-1208P. The AMS-1816P and XMS-1208P combine plug-and-play installation, QoS and VLAN support, and fast switching capacity. Both switches also include port auto-recovery and power scheduling, ensuring system reliability and uptime. and VoIP systems, where it can function as a stand-alone device or an add-on switch. when using SFP modules (sold separately). In addition, the switches’ PoE+ ports are suited for expanding networks using PoE-enabled devices such as touchpanels, VoIP, IP cameras, and wireless access points. To simplify installations, PoE+ allows integrators to use standard Ethernet cables to deliver both power and high-speed data to 802.3/af/at-compliant devices, with a total power budget of 185 W for the AMS-1816P and 130 W for the XMS-1208P. The AMS-1816P features rear panel ports; user-selectable, front-facing green or blue LEDs; variable speed fans for quiet operation; and a compact design with a depth of 8.25 inches in a 19-inch rack-mount enclosure. 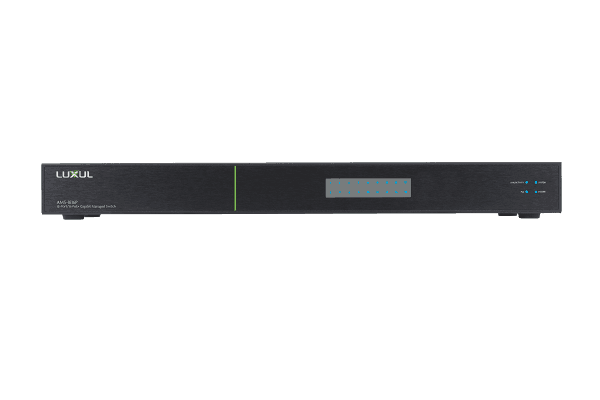 The XMS-1208P offers front-facing ports, a fanless design, and can be mounted in a rack or on a flat surface.